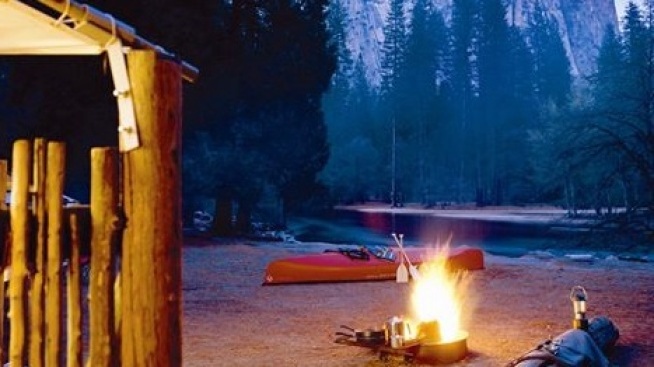 You need some Yosemite time in a traditional camp-style setting? You got it. The popular Yosemite Valley camp opens for the season on Friday, April 14. HOUSEKEEPING CAMP, which officially debuts on Friday, April 14, 2017, "weather permitting," just in time for all of that waterfall action (which can have a number of impressive weeks, let it be known). There are campfire rings for grilling at this camp, and views of Half Dome (sigh) and Yosemite Falls (sigh again) and a base that's but a short walk to the Merced River. As for where you'll sleep? Look for "concrete structures" complete with "canvas roofs and privacy curtains." There's a slew of to-knows, of course, and amenities, and tips, and all the good stuff you might need to know before your first trip to the camp, or just as a refresher, so get up on firewood 411, the pet policy, the camp store, and, yep, bears. Are the waterfalls calling? And the trees and river, too? How about every little twig and pine cone? Yep, it is time to once again say hello to outdoor, waterfall-awesome living, as Yosemite National Park yawns, stretches, and awakens for the spring.